Twelve of us braved the wind to meet at East Hunsbury to participate in what had been billed as “Hannah Barnes’ Favourite Ride” (or a ride based thereon). And it didn’t disappoint, with our chairman and Twitter-meister confirming that our ride had acquired the seal of approval from the lady herself. We headed out along the usual route towards Towcester, with a couple of new faces getting used to riding in a group like ours, and then cut across from the south side of the village towards the Silverstone circuit. Unbeknownst to us, yesterday was also the day of the Silverstone Half-Marathon so the traffic on the approach to the circuit from Silverstone village was horrible. Fortunately, once we got up near the circuit itself, we could take advantage of the cycle/footpath before leaving the motorists behind and heading down to the impressive new visitor centre at Stowe National Trust with its Nevillery Café. After refreshments, and an early lunch for some, we set out to cross flooded roads (well, one) and several hills as we tracked north-west with a cross-wind to our second NT property of the day (has Brian got shares in the National Trust?) for lunch (or afternoon tea, depending) but the weather had started to turn a little damp. 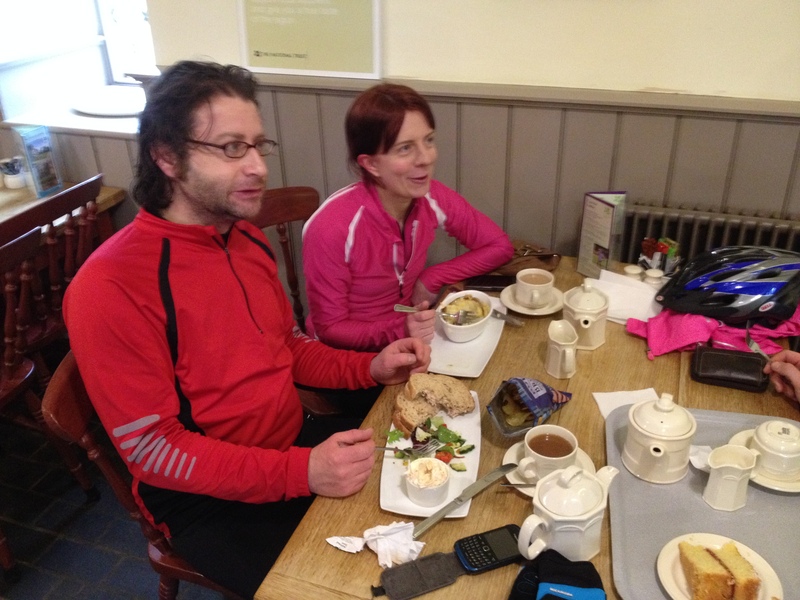 Still, plenty to keep us warm with the south Northamptonshire dips and climbs on the way over to Canons Ashby. With one of our number electing for an early finish and not stopping for tea at Canons Ashby, we were reduced to eleven riders as we headed back (with the wind now mostly, and very thankfully, behind us). A short sprint down the A5 kept it interesting then we were back onto the quiet lanes through Caldecott, Tiffield and over the canal bridges back to Northampton. Many thanks to Brian for what turned out to be a surprisingly energetic ride (I blame the headwind) and for keeping the group together so well on the road. Our route is here on RideWithGPS. 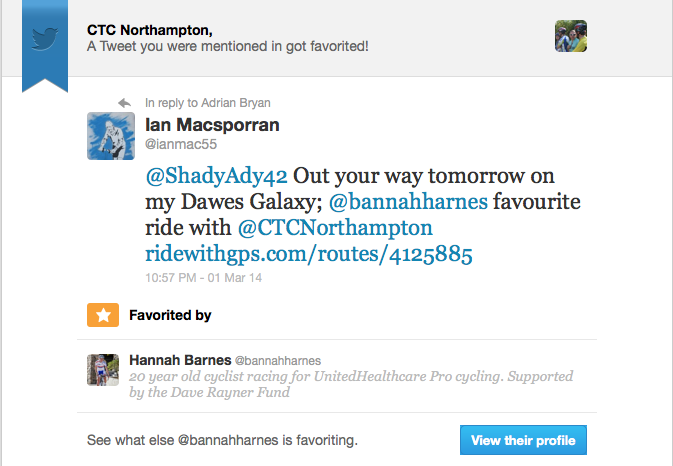 This ride was inspired by an article in Cycling Weekly in July 2013 which described the favourite training route of national rider Hannah Barnes who lives in Towcester and starts/finishes her route there. Hannah does her 40 mile route in about 2 hours but we will probably take a little longer and not just because we start in Northampton! We’ll start from Overslade Close, East Hunsbury, NN4 0RZ (behind the Tesco Superstore) at 9.30 a.m. prompt. Route: Blisworth, Shutlanger, short stretch of A5 then across to Silverstone. Down past Stowe School and on to Chackmore and the Stowe National Trust property and through the Corinthian Arch for coffee. On then to Biddlestone, Helmdon, Sulgrave, Thorpe Mandeville, and across to Canons Ashby for lunch at the NT property (sandwiches and baked potatoes are available). It is a short ride back via Litchborough, Greens Norton and Tiffield to Northampton. That makes for 54 miles. It’s hilly in parts but the roads are mainly very quiet. You can see the route here on RideWithGPS. This Sunday we’re heading down towards the south-west of the county again. We’ll be leaving East Hunsbury / Hunsbury Hill (Overslade Close, NN4 0RZ) at 9.30 a.m., approaching Towcester from the north and stopping there for a cup of coffee. From Towcester we will loop around to approach Silverstone village from the north before heading through Lillingstone Lovell and Deanshanger to lunch at the farm shop/café at Potterspury. The final leg will see us retrace our route slightly to avoid as much of the A5 as possible before we cross it and head for home via Shutlanger. I plan to be back at East Hunsbury by 4.00 p.m. but do bring lights just to be on the safe side! Total distance: 50 miles (approximately).